One kid is not too difficult to clean up after, but add three, four or more kids to the scene and things can get out of hand — fast! 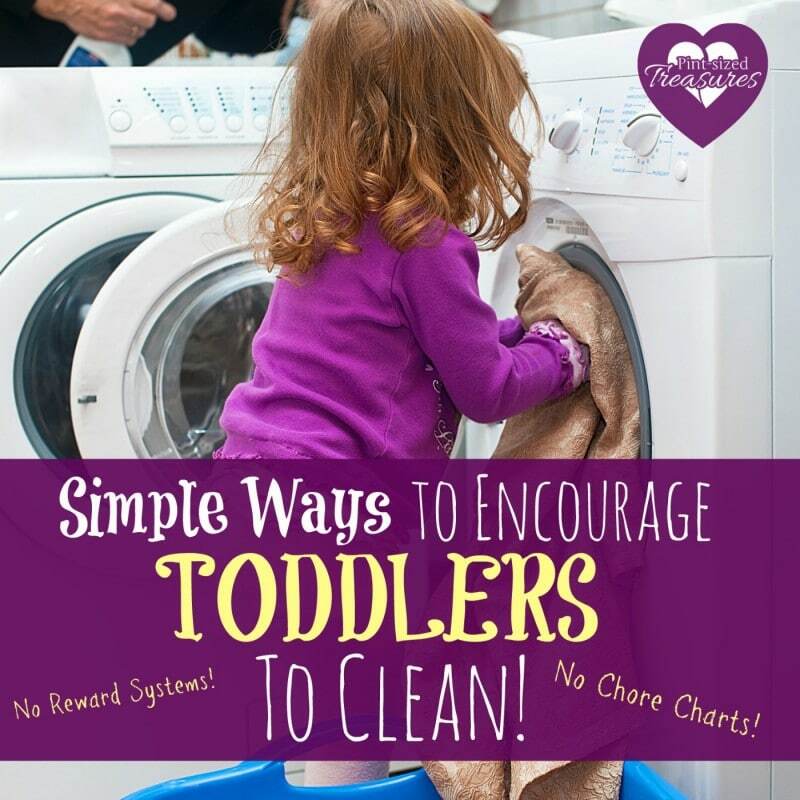 How can you encourage your toddlers to clean so things stay under control? Toddlers are super-cute, aren’t they? I seriously love the toddler age! It’s an age of learning, exploring and communicating! But, it’s also an important time for toddlers to learn some basic life-skills that will follow them all the way into adulthood. Sometimes it’s way too easy to assume those cute little chubby hands couldn’t possibly help around the house. But if those adorable, little hands can pull a toy out of the box, surely they can put the toy back into the box. Simple reasoning, eh? It would be beyond silly to expect expect toddlers to keep your home squeaky clean, but you can expect them to put away personal items and toys. What about reward systems and chore charts? Young toddlers, ranging from thirteen months old until three years old, do not typically respond well to reward systems or chore charts. Most of the time, it’s just too early for them to grasp the concepts — and may only end in frustration for you and your child. Instead, try a different approach with these tips! Make cleaning fun! Many of you know the “Clean up! Clean up! Everybody everywhere!” song, right? All of my six munchkins have enjoyed singing this song with mommy, daddy and their siblings as we pick up their shoes, toys and clothes. We have added different verses and sometimes clap and add variations to the song. Not a singing family? Try playing some fun kid music to get your munchkins to associate happiness with cleaning. Have a race! Not a competitive race, but a race against the clock! Set a timer for two minutes and excitedly explain to your munchkins you are going to try to have all the toys picked up in just a couple of minutes. Tell them to work hard and see if everyone can be done before the timer buzzes! Praise often. Encourage your kids by praising them when they do help — especially if you spy them picking up someone else’s belongings. Yes, it is their own responsibility to clean up after themselves, but they are still learning. A little bit of praise goes a long way with toddlers! Don’t overwhelm them. Don’t put a toddler in a dirty room and order him or her to “Clean it up!” Their minds are just too young to comprehend how to begin to clean up such a large mess. Instead, include them in small chores throughout the day. They can bring small wastebaskets to you, throw away pieces of trash, take folded clothes to bedrooms, wipe down chairs after dinner and pull up the covers on their bed in the morning. Give them specific directions and jobs so there is no confusion or stress. 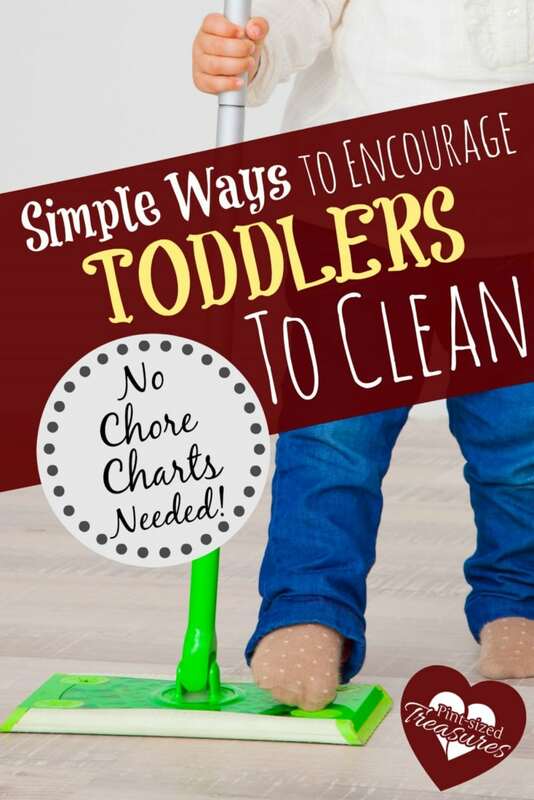 If you want your toddler to cultivate a positive attitude towards cleaning, you have to keep it simple and fun! Guide your toddlers. Take these special, tender years and spend your time guiding them through the process of cleaning and other life skills. Show them how to properly close a drawer, how to hold a dust-pan when sweeping, how to tuck in the sheets. You will be amazed at how much they can learn just by observing you work and listening to your instructions. Toddlers love to learn, don’t push them away! Limit toys. Don’t overload your toddlers with too many toys. Invest in a few toys and then insist that your munchkin does not bring more than three toys out of their room at a time. Keeping the majority of toys in one area will drastically cut down on the amount of chaos and mess that can happen from abandoned toys. If you don’t like limiting the number of toys, try this fun toy clean-up hack that my son invented! Have regular clean-up times. Pick three times per day to regularly spend 10-20 minutes cleaning your child’s play area and room. We normally choose to do this before lunch, after nap and before bed. Having regular clean-up times helps keep messes at bay and keeps your child on a routine. After a few weeks of the same cleaning routine, your toddler will instinctly start straightening up during your routine clean-up times. It’s become second-nature and a part of their everyday happenings! Have you had successes with toddlers and chores? Please share your story with us on social media!